If you build anything that requires wood frame construction, you're going to need somebody that knows it, sells it and delivers it. Herrman Lumber Company knows wood, we do that as good as anybody. We've been doing wood since 1917, so if it's wood you need, try Herrman Lumber Company. Dimension lumber stocked in sizes 2x4 through 2x12 in lengths 8' to 20' feet. Some widths in lengths up to 32 feet. Choose from grades to meet local building codes for #2 and better and select structural. In spruce, pine, fir and hem-fir. When you're unsure what size and grade you need for your project, ask your local Herrman building specialist. Treated dimensional lumber stocked in MCQ treated for areas where contact with moisture requires a rot resistant product. A must for bottom plates in contact with concrete and an affordable and lasting choice for exterior decks and railings. See your Herrman sales staff for proper grades and treatments for your project. 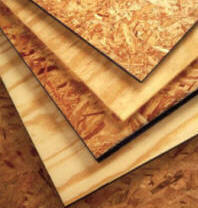 Plywood and Oriented Strand Board (OSB) products for structural or finish applications. Stocked in 4x8 sheets from 1/4" up to 3/4" thick. Finish grades A,B,C in yellow pine, fir, birch and oak. Tongue and Groove (T&G) products stocked in 3/4" thickness in plywood and OSB for sub-flooring applications. For proper application and nailing specifications, contact your Herrman sales team. When wood frame construction is required for your project. Check with your local Herrman lumber location. We have the grades, species and lengths you need to build with. When structural beams and panels are required we have those too. If it's wood, Herrman lumber is your source.